Tamo Campos grew up in North Vancouver, British Columbia, where the mountains became a part of his life from the very beginning. At 11-days-old, his dad took him in a backpack and went on an overnight backcountry ski trip, an introduction into a world that would later dominate his life. 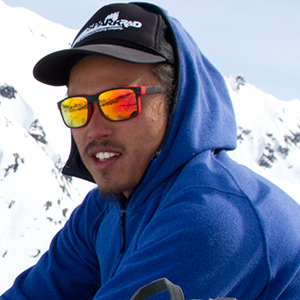 After chasing backcountry slashes and contests across North and South America for the last ten years, Tamo is now focusing his efforts on both environmental and humanitarian work, founding the organization Beyond Boarding. His latest project - The Radicals - is a perfect example of how Tamo blends his passion for splitboarding and activism. Last season's most epic adventure was when we put in a first descent in a winding chute in the remote area of Northwest BC. It was an overnight trip to get there and when we finally made it to the top of the chute fifteen stone sheep ran out of it which was pretty magical! What happened after was pretty wild. We shredded it and got down to the photographer who had just come face to face with a wolf waiting for us to ride! You always think of being alone out in the backcountry, but this adventure clearly showed the opposite. An intense, cross-continent screening tour of the Radicals, splitboarding again after my early season-ending injury last season, and mapping out some new zones on Haida Gwaii and Iskut. My favorite backcoutry rider is definitely Nicolas Mueller but I've always been inspired by local legends in my area like Kevin Sansalone, Jonavan Moore, and DCP. That all you need is two feet and a heart beat to have a good time! I ride in some pretty remote parts of the world. I wouldn't trust any other gear than Spark. Solid, light, and extremely responsive. Best binding out there yo!! A magical opening weekend of the radicals film. We are grateful for those that shared food, time, words, openings, listening & stories. Chief Willie Moon will be at the World Premiere of the Radicals Sept 20-23rd. The chief of the Dzawa’da'enuxw alongside his community are now leaeding the charge, sueing the government over recent farm tenures. Come hear from Willie first hand as one of the many panelists at the Museam of Vancouver World tomorrow night! This section of the film will have you raging to get these monstrosities off this coast! Meghann section in The Radicals sums up the interface and between athelete & artist on Haida Gwaii. She’s taught us so much about perspectives and ways of being in the mountains. Come hear from her first hand at the World Premiere of The Radicals this coming Thursday!